Thanks to Shari Delporto who submitted this information and the accompanying photograph. 1. HENRY VANDER ROZENBERG was born 1848 in Oldebroek, The Netherlands, and died 1928 in Pella, Iowa. He married DERREKJE (DOROTHY) DYKKUIZAN Bet. 1860 - 1888. She was born 1840 in The Netherlands, and died 1923 in Pella, Iowa. 2. i. MAGGIE ROZENBERG, b. 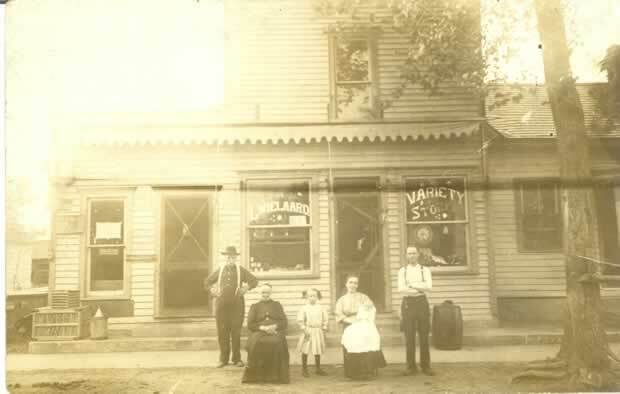 1884, Pella, Iowa; d. 1975, Pella, Iowa. 3. ii. MARY ROZENBERG, b. 1862; d. 1884. 4. iii. BENJAMIN ROZENBERG, b. 1869; d. 1916. 5. iv. DENE ROZENBERG, b. 1862. 6. v. WILLIAM ROZENBERG, b. 1872. 7. vi. HENRY ROZENBERG, b. 1885; d. 1957. 2. MAGGIE ROZENBERG (HENRY VANDER ROZENBERG) was born 1884 in Pella, Iowa, and died 1975 in Pella, Iowa. She married LEENDERT WIELAARD. He was born 1880 in New Jersey, and died in Pella, Iowa. 9. ii. AGNES WIELAARD, b. November 04, 1904, Pella Iowa; d. May 24, 1997, Pella, Iowa. 3. MARY ROZENBERG (HENRY VANDER ROZENBERG) was born 1862, and died 1884. She married GERRIT KLEIN. 4. BENJAMIN ROZENBERG (HENRY VANDER ROZENBERG) was born 1869, and died 1916. He married JENNIE HUFFERMAN. She was born 1854, and died 1916.
iii. HENRY ROZENBERG, b. 1896.
iv. RICK ROZENBERG, b. 1902. 5. DENE ROZENBERG (HENRY VANDER ROZENBERG) was born 1862. She married JACOB VERWERS. 6. WILLIAM ROZENBERG (HENRY VANDER ROZENBERG) was born 1872. He married MAGGIE VAN HUTZEN. She was born 1886. 7. HENRY ROZENBERG (HENRY VANDER ROZENBERG) was born 1885, and died 1957. 8. DELIA WIELAARD (MAGGIE ROZENBERG, HENRY VANDER ROZENBERG) She married JAKE VANDER WAL. 9. AGNES WIELAARD (MAGGIE ROZENBERG, HENRY VANDER ROZENBERG) was born November 04, 1904 in Pella, Iowa, and died May 24, 1997 in Pella, Iowa. She married ARIE VAN GENT October 04, 1924, son of DANIEL VAN GENT and JOHANNA SCHINKEL. He was born May 15, 1898 in Viana, Province of South Holland of the Netherlands, and died December 21, 1970 in Pella ,Iowa. 11. ii. LEO VAN GENT, b. December 21, 1932, Pella, Iowa; d. November 1985, Anaheim, California.